Kindle: Really, just the PDF and does not include all the bells and whistles common in e-pub books. Warning: Some resellers on Amazon buy old versions of the books and claim to sell them as “new” on Amazon (click here for an example); buy from them at your own risk. Can't bear to go out in public without an operating system? 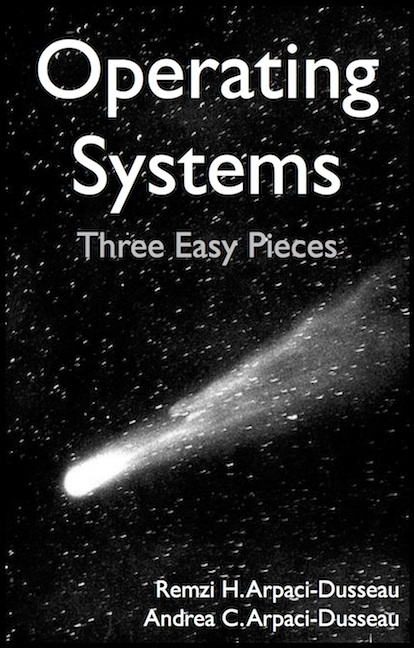 How about an Operating Systems: Three Easy Pieces T-shirt ? Donate: By popular demand, another way to support this site and its contents: donate! Click to donate $1 - $10 - $20 - $50 - or click here to donate any amount you want! Your donation helps keep this book going. Think about it: if everyone who came to this website donated just one dollar, we'd have at least three dollars. Thanks! Another way to help the book out: cite it! Here is the BiBTeX entry (seen below); you can also link to the site of the best free operating systems book on the market. INSTRUCTORS: If you are using these free chapters, please just link to them directly (instead of making a copy locally); we make little improvements frequently and thus would like to provide the latest to whomever is using it. Also: we have made our own class-preparation notes available to those of you teaching from this book; please drop us a line at remzi@cs.wisc.edu if you are interested. PROJECTS: While the book should provide a good conceptual guide to key aspects of modern operating systems, no education is complete without projects. We are in the process of making the projects we use at the University of Wisconsin-Madison widely available; an initial link to project descriptions is available here: PROJECTS. Coming soon: the automated testing framework that we use to grade projects. OTHER SYSTEMS BOOKS: Interested in other systems books? Good! Of course, we assume some background in The C Programming Language , so that's a good investment. And Advanced Programming in the UNIX Environment is a must for any shelf. On top of that, here are some OS books that could be worth your time: Operating Systems: Principles and Practice - Operating System Concepts - Operating Systems: Internals and Design Principles (8th Edition) - Modern Operating Systems (4th Edition) - Linux Kernel Development (3rd Edition) - Understanding the Linux Kernel - The Design and Implementation of the FreeBSD Operating System - Solaris Internals: Solaris 10 and OpenSolaris Kernel Architecture - Mac OS X Internals: A Systems Approach - The Design of the UNIX Operating System - UNIX: The Textbook - The Linux Programming Interface: A Linux and UNIX System Programming Handbook . ACKS: The authors wish to acknowledge all the sources of funding for their research over the years. In particular, the authors appreciate the strong support from the National Science Foundation (NSF), which is an essential part of the modern research and educational infrastructure of the USA.